Faith-based institutions play a critical role in reaching out to community members and providing information that will improve the lives of their congregants and communities. As many faith-based leaders connect physical health to spiritual health, they are in a unique position to incorporate health messages into church activities. The historic ties between the faith-based community and the civil rights movement have also motivated clergy and congregants to advocate for health equity in their communities. Fine, Fit, and Fabulous, a nutrition and fitness program. The Culinary Initiative, a healthy cooking course for culinary committee members. God’s Health Squad, a youth nutrition program. The Way, a support program for congregants living with diabetes. 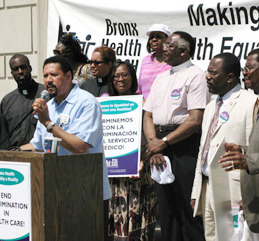 To date, 22 faith-based organizations in the Bronx and Northern Manhattan participate in the Bronx Health REACH Faith-Based Outreach Initiative. In addition, Bronx Health REACH provides technical assistance to other similar initiatives, including a Legacy Project in Virginia. For more information about the Faith-Based Outreach Initiative, contact us.